The morning chill of Agra was literally shaking our roots. It was misty and cold at 6 am in the morning. Although it was 6am, but believe us it looked as if it was 4am in the morning. Hardly could we find anybody over the Tajganj streets except a few “Doodwala” (milkman) who were lazily paddling their cycles containing large milk cans on the handles. Our auto left the narrow lanes and took the Fatehabad road. The moment we were around the Golf Course and the Taj Mahal Gardens, the chill in the air was almost unbearable. Yet it took us just five minutes to reach the main entrance of the Red Fort. 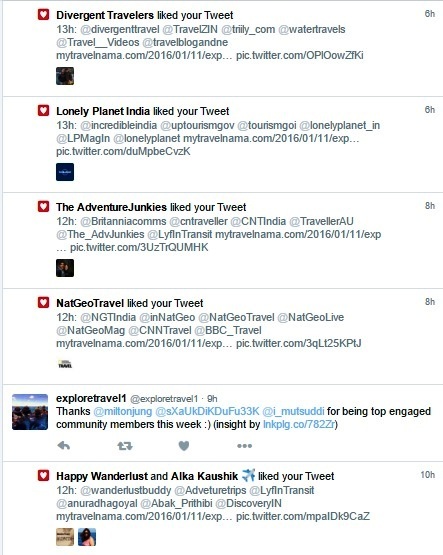 We were quite surprised to find that, inspite of the adverse weather conditions there were quite a few inquisitive tourists like us. We cleared the bills of the autowala and proceeded to the entrance of the fort before stopping to have some snaps of the front view of the Agra Fort entrance. 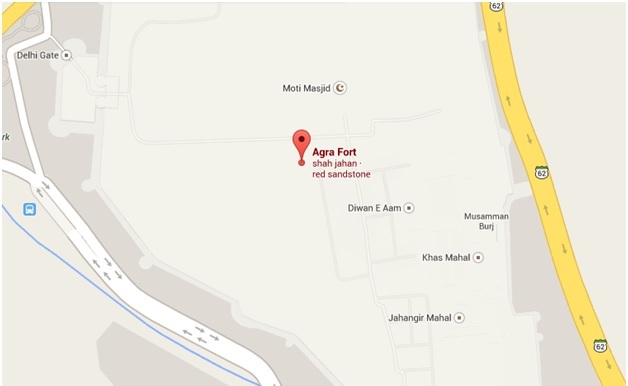 Before the Mughals, Agra fort was known as the Badalgarh Fort. Considering its location in the heart of north India, emperor Akbar (1558) thought that Agra was the suitable place to lay foundation to the Mughal capital. It is said that the emperor deployed about 4000 architects (1565 onwards) from various parts of his reign who worked day and night to complete the red sandstone fort by the year 1573. 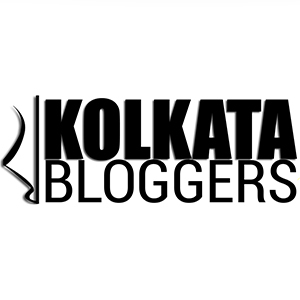 According to the chronicles of Akbar’s court chronicler, Abul Fazl, the fort built by Akbar housed around 5000 mansions which were mostly built in Bengali and Gujarati architectural styles. As Jahangir, Akbar’s son, preferred to stay at Lahore & Kashmir, hardly any notable changes were seen during his reign. Shah Jahan Akbar’s grandson during his rule at Agra, demolished many of the red sandstone mansions and replaced them with his white marble palaces decorated by exquisite pietra dura works. Later Aurangzeb the sixth Mughal emperor gave importance on strengthening the fortifications of the fort. During the British rule in India, the fort was severely damaged and defaced as they used it for housing their barracks. Today whatever remains in the semicircular fort spanning about 94 acres of land are just the ruins of its past glory. It was about 6.30am in the morning we were in front of the Amar Singh Gate which forms the main entrance to the Agra Fort. The peculiarity of the fort lies in the presence of double fortifications and hence one can obviously find two entrances to the interior of the fort. 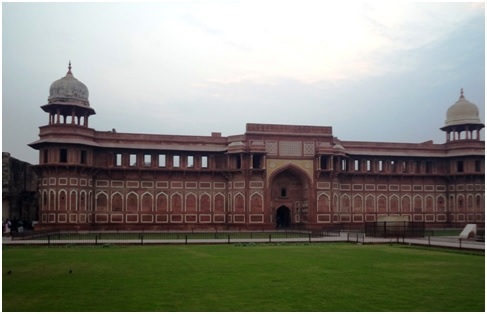 The Amar Singh gate through which we entered was actually known as the “Akbari Darwaza” in the memory of the great Mughal emperor Akbar who laid foundations to the magnificent Agra fort. The gate immediately caught our attention by its beautiful bastions whose lower portions are divided into arched panels covered by glazed tiles bearing various geometric designs and shapes. The upper parts are comparatively dull compared to the lower ones. We were quite surprised to see quite a few guides at this early hour of the day who were pleading to offer their service for leading us into the fort. Well our first job was to get the entrance tickets from the ASI counters which had just opened. Unfortunately we had an issue with change as we carried a currency of Rs 500 at such early hours. 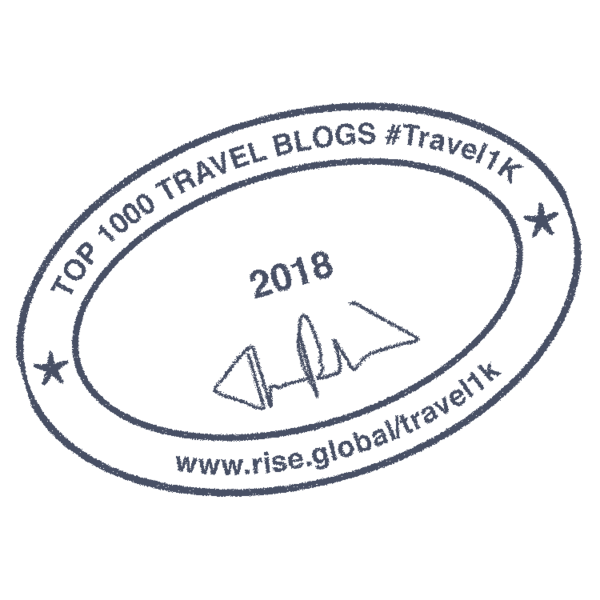 Luckily the issue was quickly resolved without any further altercation by the cooperation of a pleading guide who decided to volunteer his stock of changes with the guy at the ticket counter. Well we had no other option to acknowledge this fellow by allowing him to lead us into the fort with humble fees of Rs 100. As compared to the first entrance the second entrance leading to the interior of the fort is much more strongly built. The gateway consists of a red sandstone three storeyed mansion. 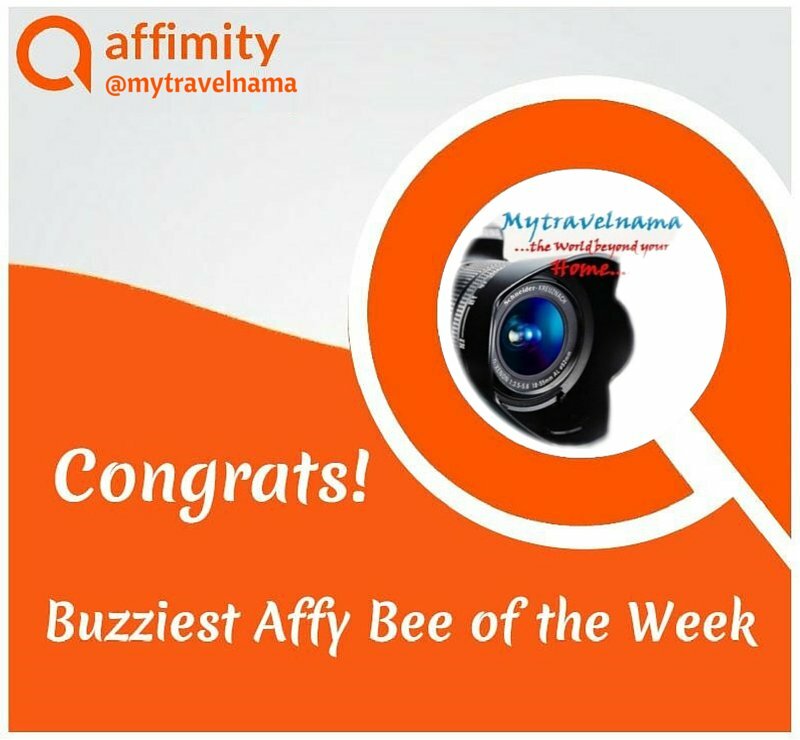 It can be easily distinguished from the first one by its sheer enormous structure and the beautiful relief works, stone carvings and mosaic works in the form of surface decorations on its walls. On the second and third floors one can find the presence of square pillars and brackets which gives the gateway a majestic appearance. The bastions containing circular low domes lying on the top look like the crown. Once we crossed the second Amar Singh gate, we were led through a wide stone pathway taking us towards the Shah Jahani gate. The pathway has a typical inclined shape which probably was built keeping in mind the marching of the horse-riders into the imperial palace complex. The stoned pathway ends into a wide courtyard where we found that we could enter into the imperial palace complex either through the Shah Jahani Gate or directly into the Jahangiri Mahal (Palace of emperor Jahangir). One of the remarkable aspects of the Agra Fort that caught our attention was its impregnability (Rath, R. 1977). 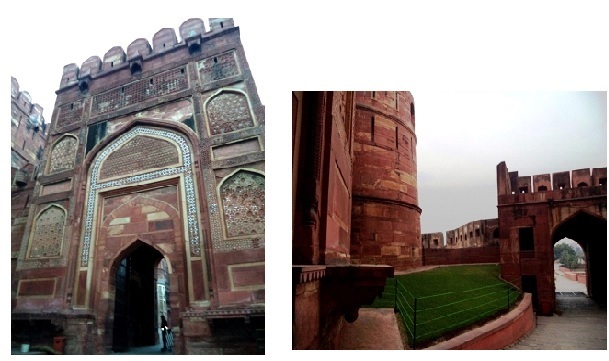 During 1599, the rebel prince Salim (Jahangir) attacked the Agra Fort along with his Shahi fauj (army). He had to return empty handed as it was literally impossible to break the fortifications of the fort. History was repeated at the time when Sahajada Khurram (Shah Jahan) rebelled (1622) against his father emperor Jahangir. 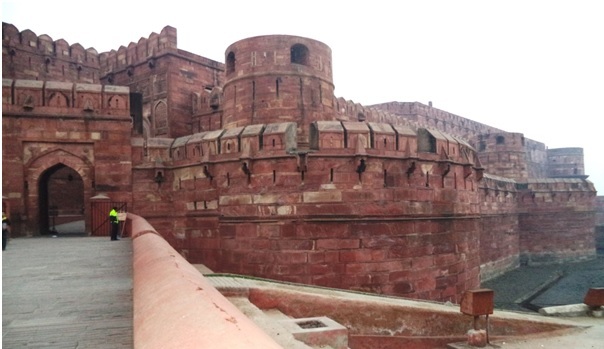 Agra Fort was a symbol of imperial power. It bore all the hallmarks of the Mughal sovereignity, power and military excellence. Looking at the extreme high fortifications we were reminded of the incident of Adham Khan (Akbar’s foster brother, son of Akbar’s wet nurse Maham Anga). The incident was picturised under the emperor’s special instructions in the Akbarnama. The original painting is nowadays preserved in the Simothosian Library, Washington. It is said that Adham Khan was running into the emperor’s chamber with a bloody sword after brutally stabbing Atgah Khan, Akbar’s prime minister to his death. The furious emperor with an empty hand disarmed Adham Khan and asked his royal guards to throw him off from the top of the Agra Fort’s fortifications until Adham breathed his last. The emperor with shear might picked up the near to be dead Adham Khan on his shoulders and threw him down to his death. The incident was shaky enough to steal the peace of any mind. We too felt disturbed when we discussed this incident amongst ourselves. It is said that Adham’s mother (Akbar’s milk mother), Maham Anga soon breathed her last after a few days of the death of Adham Khan. Akbar ensured that both of them were given due respect after their death. The tomb of Adham Khan and Maham Anga are located in the Mehrauli area of the modern New Delhi. 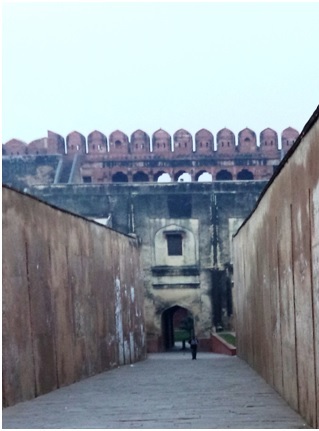 Our guide led us towards the imperial palace of Jahangir, also known as Jahangiri Mahal. 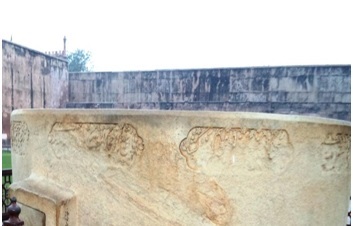 Before we could enter the palace complex, we came across the famous monolithic granite bathtub (1.22m in depth, 2.4m diameter & 7.62m circumference) used by Jahangir (Hauz-i-Jahangiri). Looking at the bathtub it was clear to us that it was a mobile tub and was probably used by the emperor during his outside campaigns and tours. We asked our guide what the inscriptions on its outer walls meant? He indicated that, these inscriptions were made in Persian Nastaliq script during the year 1611. We knew this coincided with the time when Jahangir got married to Nur Jahan. Probably the emperor got this as one of his royal wedding gifts. We were literally awestruck by the glamour and the beauty of this magnificent red sandstone royal mansion. What caught our immediate attention were its gigantic yet aesthetically decorated walls containing the huge ramparts. The palace was built by emperor Akbar and bears almost similar architectural hallmarks that we had seen in other Akbari mansions & monuments. The inlay works in the form of geometric and floral designs made by white marble is clearly an Akbari architectural style. 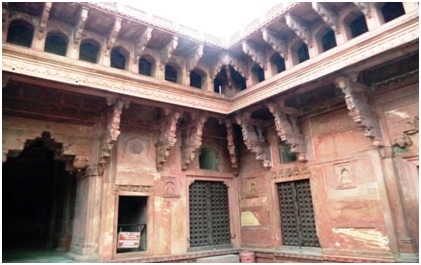 The large doorway of the entrance to the Jahangir’s palace led us to the square courtyard surrounded by two storeyed halls and living rooms belonging to the emperor Jahangir. But before that we had to go through a room containing exquisite roof designs particularly in the dome. The walls and the ceiling still bear remnants of paintings that used to enhance the glamour of this room during the Mughal rule. Coming to the courtyard and having a glimpse at the surrounding royal halls immediately creates a majestic aura which also engulfed us. 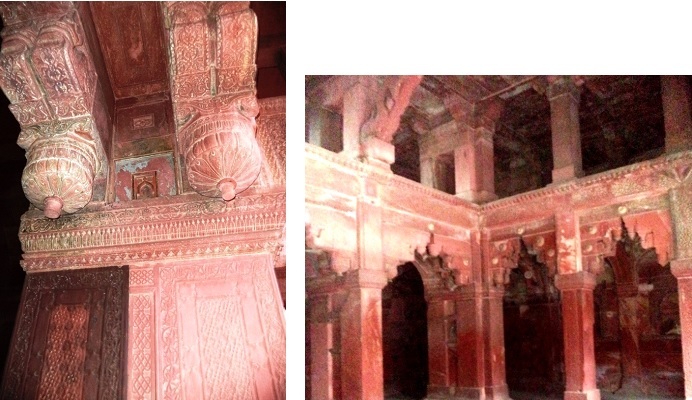 We were literally awestruck by the sheer magnificence of these two storeyed red sandstone palaces surrounding us. We were guided towards the two storeyed palace hall on our right side. This hall is supported by four square pillars with beautifully carved brackets. These were perhaps painted in blue and other colours, which had faded away with the course of time. The carvings of the brackets can be considered as rare samples of archaeological and artistic excellence which was pioneered during Akbar’s rule. The upper floor consists of a long balcony with exquisitely designed arches and “chajjas” which create a majestic appearance of the palace. The architectural patterns clearly depict the admixture of Hindu and Mughal styles the tradition of which were abundant during Akbar’s rule. 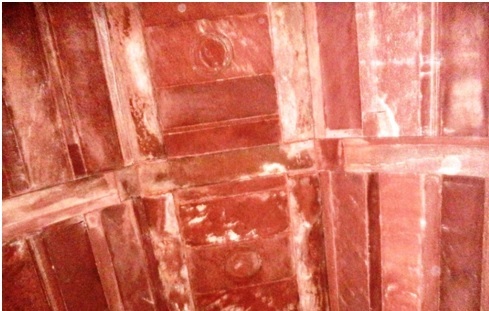 Another interesting aspect of the halls at Jahangiri Mahal surprised us, was the architectural splendour – the way by which the roofs were made. 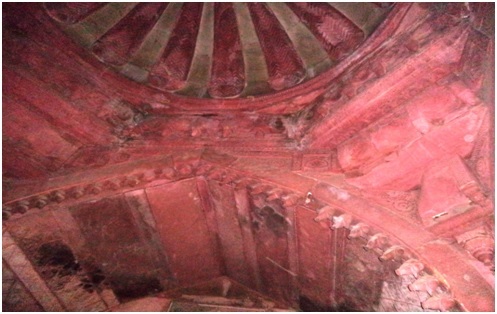 Although the roofs had an arched or semi-domed shape, they were made by joining individual red sandstone slabs held by stone brackets and arches. We wondered how these stone arches and brackets could hold the weight of the entire ceiling comprising of stone slabs. 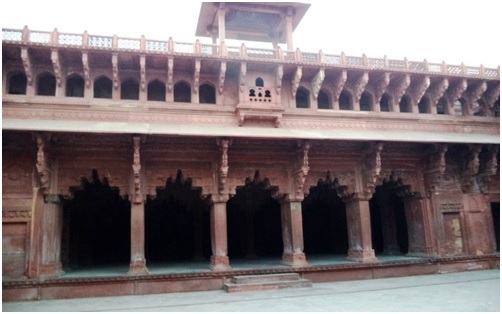 Our guide informed us that these big halls were probably used as the private resting room of emperor Jahangir. May be various entertaining events were organized at the central square courtyard to appease the emperor during his leisure times. After spending some wonderful moments at the royal halls of the Jahangiri Mahal, we proceeded towards the other rooms which probably belonged to the Royal Harem. Although most of the rooms were similar, one room immediately caught our attention. 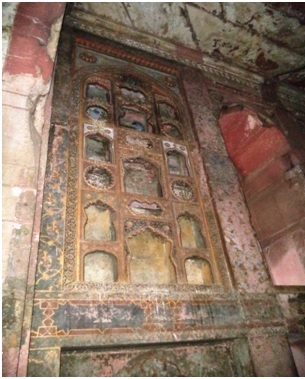 It had remnants of elaborate multi coloured wall paintings (murals) with small racks on the walls which were either used to house “deepams” or lamps or Hindu Idols for worshipping. Probably the room might have been used by Jodh Bai, one of the important begums of emperor Jahangir. 75% of the Agra Fort is nowadays coccupied by the Indian army. Being tourists we were only allowed to see just 25% of the fort. 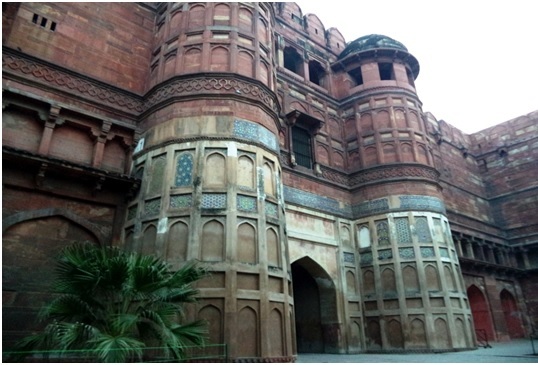 Many of the other arechitectural splendours of this great fort were built by Akbar. And unfortunately tourists like us hardly are allowed to see any of these mansions. According to Abul Fazal, Akbar’s court chronicler, the emperor had built 500 mansions. Out of these 500 mansions only two buildings are nowadays visible to us. These are the Jahangiri Mahal and Akbari Mahal.